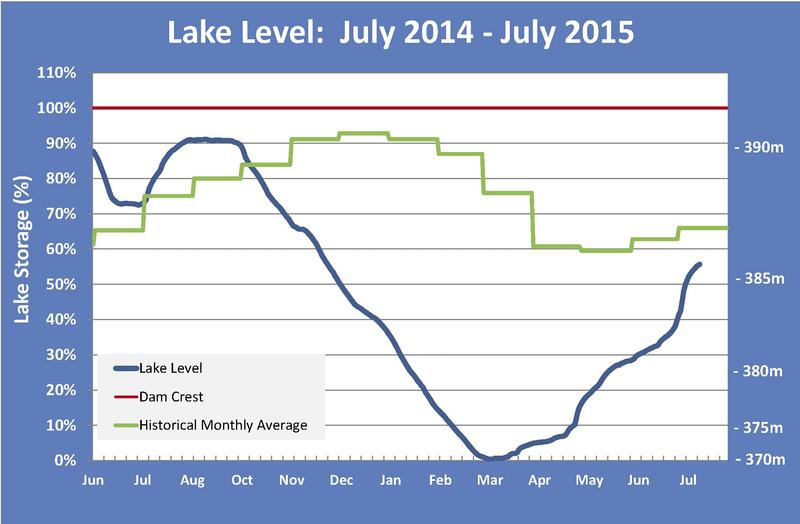 As at 15 July, the lake level has reached 55.7% (385.6m RL). The chart indicates that this is still below the historical average for July of 66% (387.1m RL) and below the level at the same time last year 76% (388.4m RL). However, the steady fill of the lake since reaching its minimum level in early March is encouraging. Releases from the dam have been maintained at a minimum of 1.5 cumecs since March as every effort is made to increase the lake storage with a target of being close to 100% full by the end of September. There is currently some snow on the hills behind the dam, and more than last year, however (at this stage) it does appear to be a significant amount that would provide some confidence of getting high spring inflows from snow melt.